New Jersey Governor Chris Christie's move comes a day after a judge said he broke state law by withholding $1.6 billion from the retirement system. New Jersey Governor Chris Christie will seek to roll back pension-fund contributions in his next budget, a day after a judge said he broke state law by withholding $1.6 billion from the retirement system this year. The 52-year-old Republican will present a spending plan Tuesday that seeks to contribute $1.3 billion to New Jersey’s government-employee pensions for the year starting July 1, according to a figure released by his office. That’s less than half the $2.9 billion it was scheduled to pay. For the governor, the pension decision comes at a pivotal moment as he considers a run for the White House next year. After being dogged by a scandal over deliberate traffic jams at the George Washington Bridge and a struggling economy, Christie has sought to boost his national profile with trips across the U.S. and abroad. Now, he’s refocusing on New Jersey, where his approval rating has fallen to record lows, with his latest plan to manage revenue shortfalls and rising pension costs. “The longer we push off the inevitable because it’s easier to let it be someone else’s problem, the harder it will be to solve the problem,” according to prepared remarks for Christie’s budget address. The release of Christie’s budget plans come after state Superior Court Judge Mary Jacobson sided with unions that sued him for paying $1.6 billion less than the $2.25 billion due to the retirement fund this year. 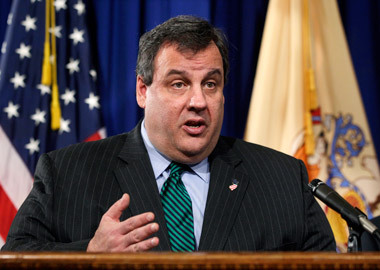 Christie plans to appeal the ruling, spokesman Michael Drewniak said. The decision promises to put added pressure on Christie, who is already facing a political battle over how to balance the budget in the next fiscal year. New Jersey’s nonpartisan Office of Legislative Services said Monday that the state would need $7.4 billion more that it’s expected to have in order to meet all legal requirements and fund the government’s programs at current levels. The state’s failure to set aside enough money to cover employee benefits has contributed to a record eight credit- rating downgrades under Christie, who came into office pledging to deal with rising retirement costs. Illinois is the only other state with a lower rating. The governor, who has clashed with labor unions over benefits, last year backed out of an agreement to boost pension contributions to make up for years of underfunding. That decision helped close a budget deficit that emerged after income-tax collections unexpectedly fell short of his forecasts. Christie, during his budget address, will also release overhauls aimed at cutting the state’s retirement costs, his office said, without providing details. The governor said a year ago that unions and Democrats must agree to more changes in retirement and health plans because his 2011 overhaul didn’t go far enough to contain costs. A panel he created has been studying the issue. “We can get this done,” Christie said in comments released by his office late Monday. “We have proven time and again that even when we look like we’re not going to make it work and that politics and partisan interests have won, we flip the script.” Christie enjoyed approval of 70 percent for his leadership in the aftermath of Hurricane Sandy in 2012. Those numbers dipped last year after the release of e-mails linking allies to the shutting of traffic lanes leading onto the George Washington Bridge from Fort Lee, whose Democratic mayor declined to endorse Christie for re-election. The incident spawned a federal investigation that has spread to former authority chairman David Samson, Christie’s top appointee at the agency. Prosecutors are probing Samson’s business interests and potential conflicts of interest, according to a list of subpoenas disclosed by the Port Authority of New York and New Jersey in a bond offering statement. Investigators also are looking into Samson’s personal travel, the Record newspaper reported this month. Prosecutors have subpoenaed records relating to an airplane hangar at Newark Liberty International Airport, a person familiar with the matter said. – To contact the reporter on this story: Terrence Dopp in Trenton at tdopp@bloomberg.net. To contact the editors responsible for this story: Stephen Merelman at smerelman@bloomberg.net William Selway, Stacie Sherman. — Check out 3 States That Shuttered Pension Plans and Paid for It: NIRS on ThinkAdvisor.